This time I want to devote a post to a situation I haven’t been in that often. The customer was migrating from Windows XP to Windows 7, well.. nothing special here, but also migrating from local profiles to (partially) redirected profiles, well.. that’s a challenge. So to capture the userdata AND -settings we had to come up with something special. Of course we could do some things with scripting, but the biggest challenge was the fact that the new (partially redirected) profile location was only available after the first logon to Windows 7. (On Windows XP) A batch file that kicks of Scanstate. Nothing special here, just used /uel:1 or /uel:0 to get the user profile we need (0=Logged on user, 1=Modified accounts last 24 hours). (On Windows XP) A batch file that copies the captured data and settings to the users share on the network. (On Windows 7) A batch file that copies the captured data and settings back to a local drive. (On Windows 7) A batch file that kicks of Loadstate. Nothing special here, just used /ue to exclude some possible captured local/ admin account. (On Windows 7) A batch file that copies the last bits of data straight in to the redirected profile. This specific part would copy the desktop items to C:\Temp\Desktop instead of the desktop location in the (redirected) profile. Also important to note is that, in this case, all the copy actions have to run with user rights, as it’s all copied to the users directory. When these packages are present, right-click the Task Sequence node and select Create Task Sequence. After that follow the step-by-step below. On the Install Windows page, browse for the Image package, uncheck Partition and format the target computer before installing the operating system, (optional) fill in a Product key, (optional) select Always use the same administrator password and click Next. Note: It’s really important to uncheck Partition and format the target computer before installing the operating system, because otherwise it’s not possible to store the data locally. On the State Migration page, select Capture user settings, Browse for the USMT Package, select Save user settings locally and click Next. Note: As these settings are not part of the step-by-step, they are left to default. Now the basic task sequence is ready and it only needs a little bit of ‘tweaking’. This can be done with the Task Sequence Editor. Also notice that the basic task sequence already sets the ‘extra’ task sequence variable OSDStateStorePath. Note: This is necessary to make it possible to also capture user files and settings in WinPE. 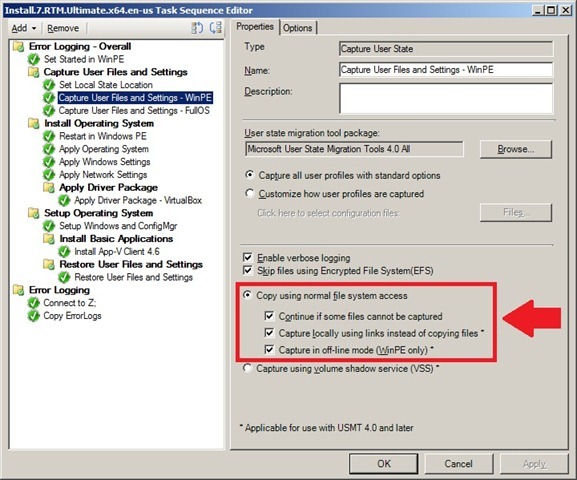 Select the Capture User Files and Settings Step (optional: change the name), select Copy by using file system access and check Continue if some files cannot be captured and Capture locally by using links instead of copying files. Now go to the Options tab and add the condition of _SMSTSInWinPE equals FALSE. Note: This is necessary to make this step only run in FullOS. Note: This is necessary to make this step only run in WinPE. The task sequence is now done and ready to be deployed. 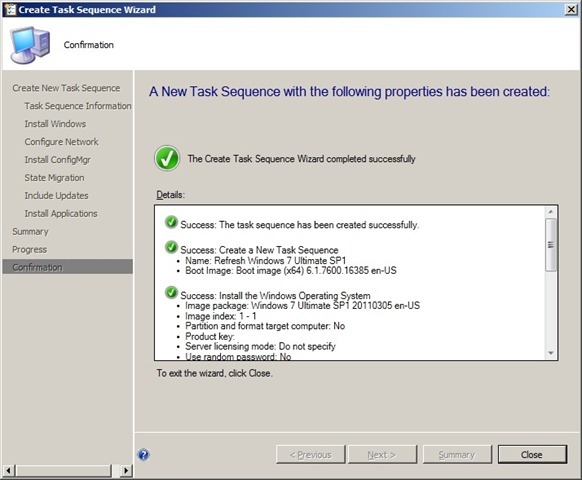 The result is a task sequence that will do a hard-link migration in both, WinPE or FullOS. 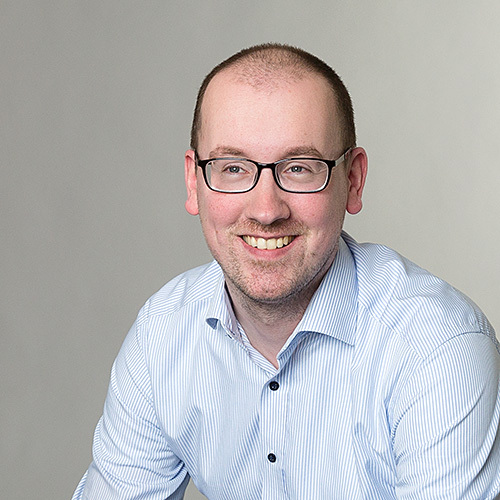 Its about time that I write my first post about ConfigMgr vNext BETA and well I really have to say that it just gets easier and easier compared to ConfigMgr 2007. The only thing I have to get used to is that everything is in a different location. 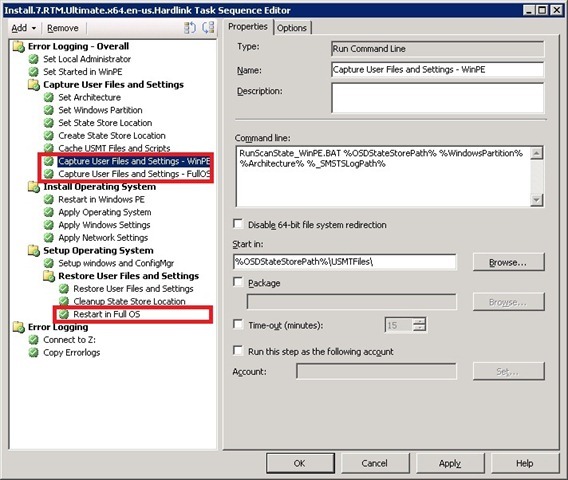 Even the variable OSDStateStorePath gets set to %_SMSTSUserStatePath% automatically by selecting Save user settings locally during the Create Task Seqeunce Wizard. Another cowl feature I ran into, with creating the Operating System Image for the Task Sequence, is the option to Schedule Updates for an already created Operating System Image. 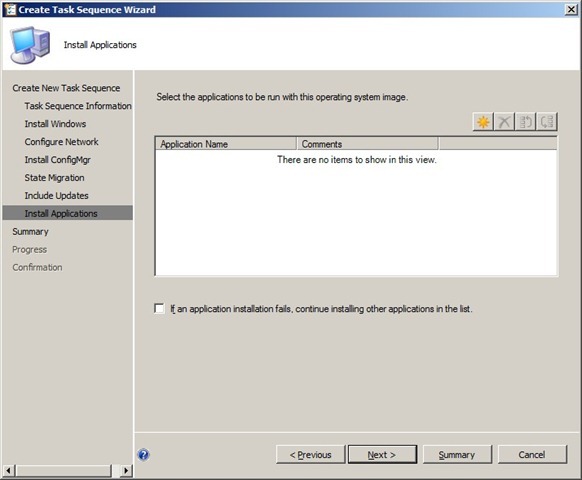 By doing this ConfigMgr will insert the selected updates into the Operating System Image. No more problems with installing Software Updates during the Build and Capture –proces, can it get easier then this? 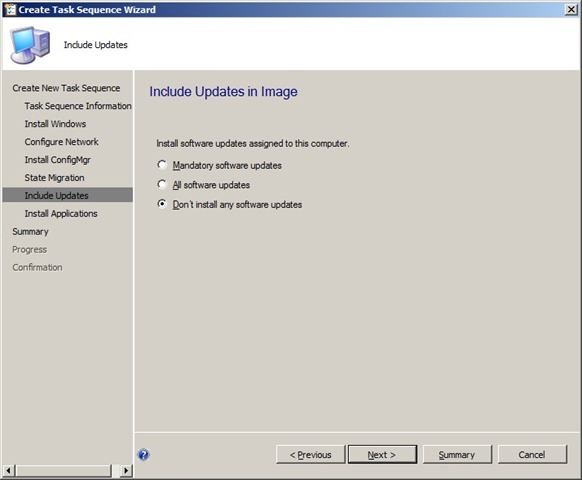 After this it is also possible to see the which Software Updates exist in the Operating System Image (see picture). Now you will always be able to see how up-to-date your reference image is! Of course there are lots and lots of more cowl feature, like the Software Center, the Online Software Catalog, the Automatic Grouping Rules for Software Updates, the Client Agent Settings, etc, etc, etc… But, at my defence, these are all to big to be covered in one post. They always say never change a winning team, but sometimes its just cowl to see if its possible to be even better. I had the same with a previous post in which I already showed how to do a Hard-Link migration, when started from WinPE (and FullOS). The biggest part of that example is still the same, but some pieces changed to get a better result. In this post I will go step-by-step (again) to mention the changes that I made to make it even better. At the end of both parts of this post I will shine a light on the changes that I made. This step sets the Task Sequence Variable TSStartedInWinPE to YES. This Task Sequence Variable only gets set when _SMSTSInWinPE is TRUE. This step sets the Task Sequence Variable Architecture to amd64. This variable will be used for selecting the USMT 4.0 version for (in my case) 64-bit systems. This step sets the Task Sequence Variable WindowsPartition to C:. This variable will be used for selecting the Windows partition. This step sets the Task Sequence Variable OSDStateStorePath to %WindowsPartition%\StateStore. This variable will be used for creating and selecting the User State Location. This step creates the directory %WindowsPartition%\StateStore by running the Command line: cmd /c MKDIR %OSDStateStorePath%. This step does the actual Offline Capture of the User Files and Settings by running the Command line RunScanState_WinPE.BAT %OSDStateStorePath% %WindowsPartition% %Architecture% %_SMSTSLogPath% which has to start in the directory %OSDStateStorePath%\USMTFiles\. This step only runs when the machine is started from WinPE. This is done by checking if the Task Sequence Variable TSStartedInWinPE is set to YES. This step does the actual Online Capture of the User Files and Settings by running the Command line RunScanState_FullOS.BAT %OSDStateStorePath% %WindowsPartition% %Architecture% %_SMSTSLogPath% which has to start in the directory %OSDStateStorePath%\USMTFiles\. This step only runs when the machine is started from FullOS. 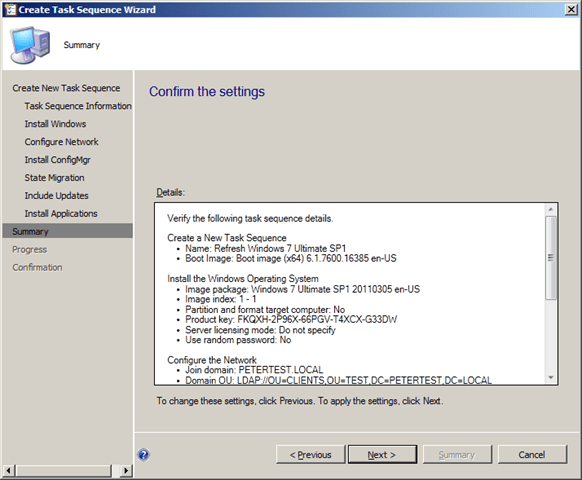 This is done by checking if the Task Sequence Variable TSStartedInWinPE is not set to YES. I use now a batch-file for both, and Online and Offline Capture. Why? Just because it gives me more flexibility and because I can get rid of a few “double” steps. For example, now I can use the same Store Location (variable) for both Captures Types. I use now a different location for the logfiles. Why? Just because it gives me an easy possibility to save the log until the end of the Task Sequence. This step does the actual Restore of the User Files and Settings by running the Command line RunLoadState.BAT %OSDStateStorePath% %WindowsPartition% %Architecture% %_SMSTSLogPath% which has to start in the directory %OSDStateStorePath%\USMTFiles\.. This step will restart the computer, but only when _SMSTSLastActionRetCode is equal to 2.
echo y| "%~dp0%2\usmtutils.exe" /rd "%1"
I use now also batch-file for the Restore. Why? Just because it gives me more flexibility and because I can get rid of a “double” step (setting the Hardlink options). I use now an optional restart of the computer. Why? Because I noticed that sometimes USMTUtils ends with code 2, which means that it needs a restart to get rid of the last files. Note: The RunScanState_FullOS.BAT, RunScanState_WinPE.BAT, RunLoadState.BATand the RunUSMTutils.BAT have to be placed inside the USMT Package at the same level as the amd64- and the x86-folder. As I had a lot of questions about the use of USMTUtils, I decided to devote a new post to this. In my previous post I used USMTUtils to clean up the hard-link statestore location. WARNING: This command is going to delete the following list of path(s). Are you sure you want to proceed (Y/N)? The conclusion here is that running the command-line usmtutils.exe /rd <storedirectory> will need a confirmation. This is the point where we have to grab back to a batch-file, so we can pipeline a positive response to the question asked by the USMTUtils. This can be done by using echo y|. So the batch-file, that we need to run the USMTUtils from a Task Sequence (with ConfigMgr 2007), has to include the command-line echo y| usmtutils.exe /rd <storedirectory>. I hope this post gives a bit more inside information of why it is needed to pipeline a confirmation with the use of USMTUTils. In a previous postI already showed how to do a Hard-Link migration, when started from FullOS. That part still exists in my Task Sequence, but it is now moved under the Group Capture User Files and Settings – FullOS. This part will now only run when the Task Sequence is started from FullOS. In this post I will add a part to the Task Sequence that makes sure that the User State will also be captured, when the Task Sequence is started from WinPE (also called Offline Mode). The cool part is that it will also be done by/ with using Hard-Links! This group Captures the User Files and Settings when the machine is started from WinPE. This is done by checking if the Task Sequence Variable TSStartedInWinPE is set to YES. This step sets the Task Sequence Variable Architecture to amd64. This variable will be used for selecting the USMT 4.0 version for 64-bit systems. This step does the actual Capture of the User Files and Settings by running the Command line RunScanState.BAT %OSDStateStorePath% %WindowsPartition% %Architecture% which has to start in the directory %OSDStateStorePath%\USMTFiles\. These are all the steps I need, to do an Offline Capture with Hard-Links. Now let’s take a closer look at the batch-file which does most of the work. In this batch-file I am using three variables which are being set during the Task Sequence (and explained in the batch). The Scanstate command line, that is being used, is completely based on the standard syntax. Under here I created a table in which can be seen what every part of my command line stands for. /o Enables the possibility to overwrite existing data in de Migration Store. /nocompress Disables the compression of data. After the User Files and Settings have been captured, they need to be restored again to the new OS. For this I use the default Restore User Files and Settings step from ConfigMgr 2007 and the variable OSDMigrateAdditionalRestoreOptions. This variable is filled with the options /nocompress /hardlink, see for this also my previous post. This default step will restore everything that is found in the State Store Location. With the red arrow in the picture I point at another important step (which is often forgotten). 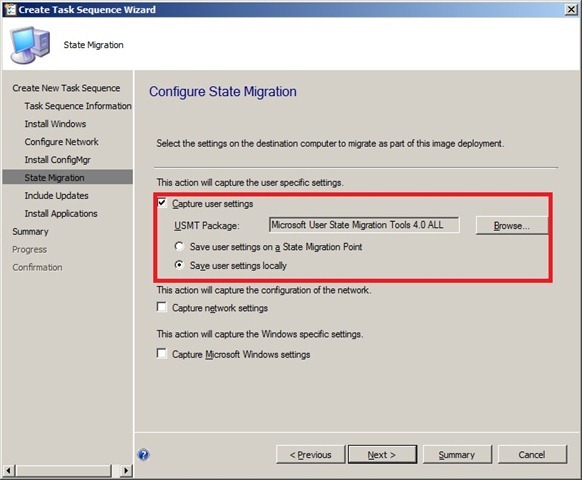 This step is the Cleanup User State Location, a Run Command Line step from ConfigMgr 2007. This step cleans up the State Store Location by running the command line RunUSMTutils.BAT %OSDStateStorePath% %Architecture% from the USMT 4.0 Package. Now let’s take a look at the batch-file which does most of the work here. The important part in here is the echo y|, because only running umstutils.exe /rd will ask for a confirmation on the action. I have to say that I really missed this in the documentation! So just use echo y| to pipeline a positive response on the confirmation, asked by the usmtutils. Note: The RunScanState.BAT and the RunUSMTutils.BAT have to be placed inside the USMT Package at the same level as the amd64- and the x86-folder. It took a while but this weekend it was finally time for some testing of, what’s code-named, “Modena”. Modena is a tool, developed by Microsoft IT, that enables the ability of an End-User Experience by using a powerful OSD Wizard. When you are searching for a way to get your users “involved” in an OS Deployment, then I would recommend you to take a look at Modena. The OSD Wizard of Modena (see picture) can be changed in a lot of different way’s. As an administrator you can select which settings can be done by a user and which are pre-set. By these customizable settings you can think about things like computername, domain, local administrators, language, time, image, backup (via USMT 4.0) and the applications. The nice thing about the applications is that you can first do a scan of the computer to see what applications are currently installed. Based on the results of this scan, applications can get pre-selected (or not). Besides al of these settings Modena also provides a better insight in what is happening with the computer during the Task Sequence. …and take a look at these links for the story behind Modena. One of the coolest new functions of USMT 4.0 is the new hard-link migration store (only for computer-refresh scenarios). These migration stores are stored locally on the computer that is being refreshed and can migrate user accounts, files and settings. This way it will save time and space during a computer-refresh (and you do not need a State Migration Point!). OSDStateStorePath: Defines the path to the user state store. This path must be on a local drive. As path I use the value: %_SMSTSUserStatePath%. 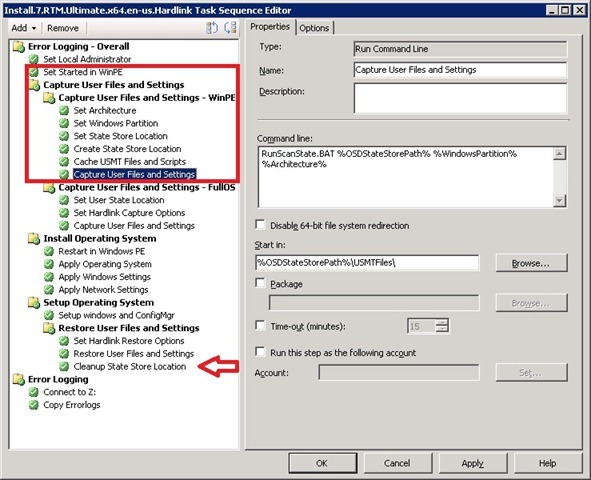 This Task Sequence Variable must be set before the step: Capture User Files and Settings. 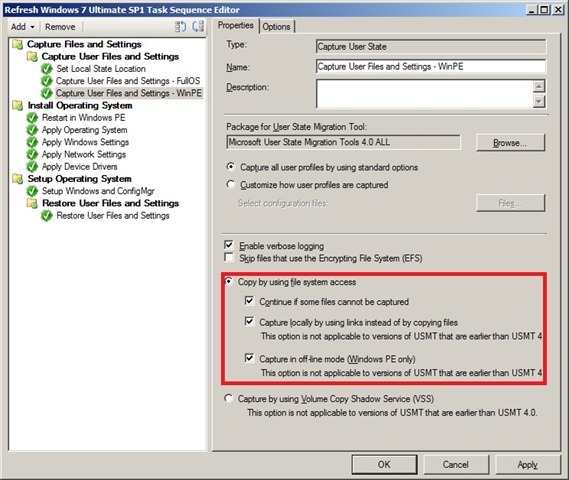 OSDMigrateAdditionalCaptureOptions: Specifies the extra options needed to perform a hard-link migration capture and must include /nocompress /hardlink. 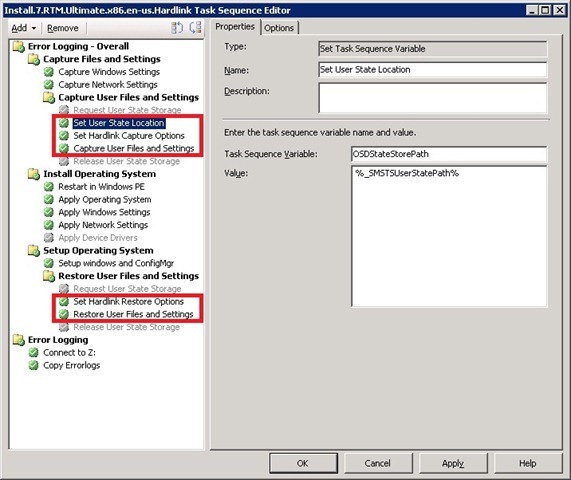 This Task Sequence Variable must be set before the step: Capture User Files and Settings. OSDMigrateAdditionalRestoreOptions: Specifies the extra options needed to perform a hard-link migration restore and must include /nocompress /hardlink. 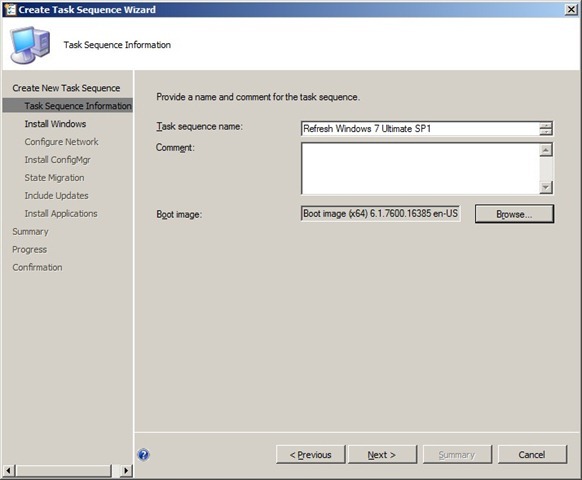 This Task Sequence Variable must be set before the step: Restore User Files and Settings. The picture with this post shows a plain and simple example about how a Task Sequence could look with hard-links enabled. In the red rectangles I created my Task Sequence Variables and the still needed steps of Capture User Files and Settings and Restore User Files and Settings. 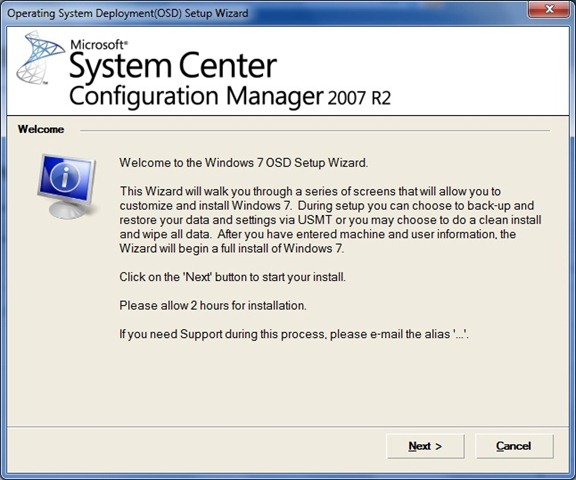 Because I still use these default ConfigMgr 2007 steps it is not possible to run the capture in WinPE.